The zombie apocalypse is upon us! The infection is spreading, and you must stop it... unless, that is, your cynicism, darkness, denial, or overwhelming hunger for fresh brains has overshadowed your will to save humanity. ​ Who can you trust in this game of deception and shifting allegiances? Even those who are silent may be lying to your face. You must summon all your intelligence and intuition to identify friend from foe and turn your enemies against each other to survive. You must fight for survival as you are plunged into the war between Zombies, Survivors, and Maniacs, taking on the roles of up to 14 unique characters with special abilities and innumerable combinations. Only your cunning and quick thinking can lead you to victory. ​ You've only got to make it through the night-do you have the brains to get the job done? 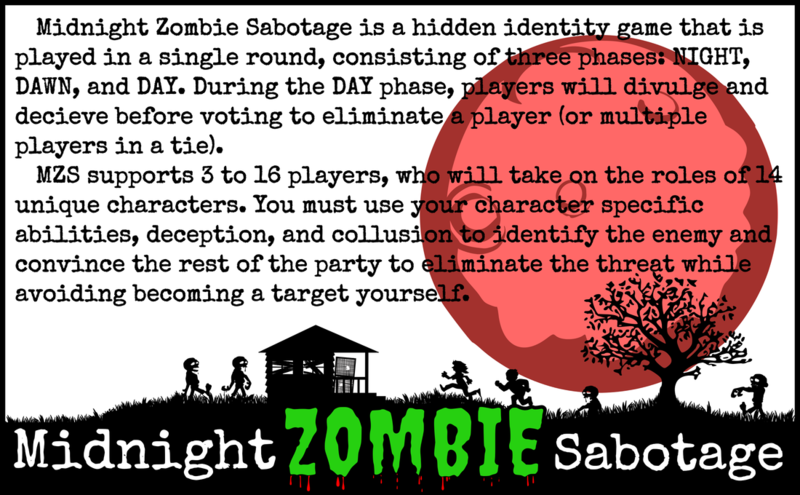 Midnight Zombie Sabotage is here. Find us on Facebook, Instagram, and Email or by clicking the buttons shown to the right!